Does your homeschool organization need some ideas for raising money? Carol Topp, the Homeschool CPA, shares ideas for easy fundraising in this episode of the Dollars And Sense Show. In the podcast Carol mentioned a warning: No Individual fundraising accounts! We’re a 501(c)(3) tax exempt organization (Thanks for helping us with that!). In your letter to us you say that if we “solicit contributions” we may need to register in our state. We don’t ask for donations, but we do have several fundraisers each year. Are our fundraisers considered “solicited contributions”? Congratulations on your 501(c)(3) tax exempt status from the IRS. Now it’s time to determine what your state requires from your organization. Determining whether your nonprofit is exempt from charity registration can be difficult. Exemptions vary from state to state. To determine whether your nonprofit is exempt in your state, you could look up the charitable solicitation laws of that state. The law is usually found on the Attorney General or Secretary of State’s website. Or contact me, Carol Topp. I can do the research for you since I know what I am looking for!. This service includes drafting a letter for your board and future boards explaining the all required forms in your state with due dates. Cost: $50. Is my homeschool graduation fundraiser breaking the law? The past 3 years we have held a graduation. The graduate families have been doing the fundraising, with the amount earned going into our checking account and then paid out for speakers, food, programs, and etc. 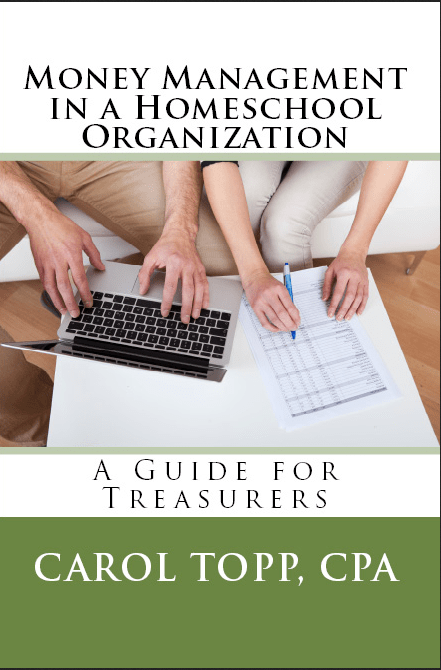 I am concerned after reading your book Money Management in a Homeschool Organization: A Guide For Treasurers that we have been doing this all wrong! Are we instead supposed to fund raise as a whole group, and have graduation as a budgeted item in place of creating the graduation fund in our checking account? The fundraising to pay for the graduation expenses is fine. The fundraiser proceeds are going to an event that your homeschool organization operates, not to individual families. What is prohibited by the IRS is private inurement which is when an organization earmarks fundraiser proceeds as belonging to specific families to defray their specific and particular expenses. That’s a no-no. The purpose of those fundraising monies to to further your exempt purpose (homeschooling), not to give a financial break to specific, individual families. There was a homeschool group that showed me their spreadsheet of about 10 fundraisers(!) and the 20 families that participated and how each dollar of profit from the fundraiser was divvied up to each family. Yikes! It was a record-keeping marvel, but prohibited by the IRS! I warned them to cease and desist immediately. I think the graduation event should be included in your budget with both the revenues (parents paying money and the fundraisers proceeds) and the expenses (speakers, food, programs, etc) recorded. Our homeschool coop’s sports team decided to do a fundraiser using Scrips. The group is going to make each individual player buy their uniform instead of renting it from the team. So last August, the co-op started individual family accounts using money made from Scrips to be able to be applied toward buying individual uniforms. According to some of the information I just read on your website (http://homeschoolcpa.com/do-not-use-individual-fund-raising-accounts/), I am concerned that this violates the rules for 501 c(7) non-profit social groups. Am I understanding it correctly that allowing individual athletes to fund raise using Scrips to offset individual uniform cost is not allowed for 501 c(7) non-profits? Is this truly is an improper use of fundraising proceeds? You are correct that usually individual fundraising accounts are prohibited for 501c tax exempt organizations as I wrote about here and here. But Scrip is an exception to the “No individual fundraiser accounts” rule. Great Lakes Scrip requested a private letter ruling from the IRS in 2009 stating that their program does not create income to the parent or inurement because they are rebates and not payment for services. BTW, these IRS private letter rulings cost thousands of dollars. The IRS letter is 9 pages long and probably more than you care to read. Fortunately, Great Lakes Scrip provides a a nice, plain-English summary of the tax implications from using their scrip program. Take a little time to read the document from Great Lakes Scrip to be sure you are running your Scrips program correctly. Regular scrip often results in a nonprofit handling a good deal more money than it ever has previously. For example, an all-volunteer group may be used to handling hundreds of dollars, but with scrip they may be handling tens of thousands of dollars in a short period of time. Doing so requires conscientious volunteers who have strong ability to manage funds carefully, promptly, and ethically. Carol Topp, CPA, the HomeschoolCPA will share tips on important issues that homeschool leaders may not know about. This episode will focus on helping homeschool leaders know the tax rules about fundraisers. Are you asking for donations on your website? Does your homeschool group accept donations on your website? Lots of nonprofits do and its a handy way for donors to send a donation. But did you know that having a donation button on your website could mean that your organization would need to register as a charity in almost all 50 states? What a load of paperwork! Harbor Compliance explains that, fortunately, many states follow the Charleston Principles for accepting donations on a website. The principles leave a lot of room for interpretation, which brings us to some practical state-specific pointers. Always register in your state of incorporation. Following-up with fundraising contacts residing in unregistered states may trigger registration. For example, you receive an unsolicited and insubstantial contribution through your website from a resident of a state in which you are not registered. If you then solicit that contact via e-mail, phone, mail, or any other medium, that will be treated as solicitation triggering registration. E-mail is generally treated the same as a mail or in-person solicitation. Soliciting through a charity portal alone such as www1.networkforgood.com does not trigger registration. That is because it is a donor-advised fund that exists to distribute funds to other nonprofits. Technically the donation is given to the fund as the payee. Scrutinize any website before assuming it is a donor-advised fund; their fine print may pass the burden of charitable registration on to you. Your nonprofit may consider hosting a non-interactive websites that encourage donations through third-party sites or offline means. This may still trigger registration – it is not a loophole. You can use social media to send out information about your nonprofit’s activities without needing to register. When your language invites solicitation, you do need to register. A fan promoting donation independent of the nonprofit does not trigger registration. Thanks to Harbor Compliance for this helpful information. We have a question about fundraising and sponsoring subgroups. Our homeschool group is planning on filing for 501c3 soon (if we can’t figure it out, we are hiring you!). We have a subgroup (Destination Imagination, comprised of a few smaller groups of kids) that wants to raise money by working basketball games themselves but use our insurance and have us deal with paperwork and money. We will have a clear understanding of who gets what money and when before we vote on it. They have proposed we keep 5% for our trouble. We are all wanting to say yes, but as president, I need to make sure it’s okay rule/law-wise. Can you think of a reason not to allow this? Good luck in your 501c3 application. I can also review the application you fill out. It’s a less expensive option. What you are proposing is called “fiscal sponsorship” or sometimes “fiscal agency.” It means that one nonprofit organization acts as a sponsor for a project or group that does not have its own tax-exempt status. And as you spelled out, it is typical for the sponsor to charge a fee (5% in your case) for managing the other project or group. Google “fiscal sponsorship” to get a better idea of what’s involved. I would recommend you wait until you have tax exempt status (or at least have applied for it) before considering a fiscal sponsor arrangement. Also put the agreement in writing, so all parties know what is required of the and the length of the agreement (at most one year and renew it every year). Sounds like you were going to do that. Make sure the arrangement doesn’t put you over any IRS threshold. For example, if your gross annual revenue is more than $50,000/year, you will need to file the Form 990-EZ or 990, not the simple online Form 990-N. If Destination Imagination income causes you to hire someone to prepare the more complex Form 990-EZ/990, are you making enough from DI to cover that added expense?